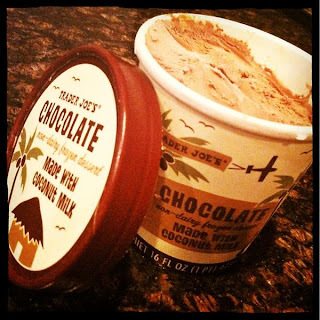 Let's cut the dairy and introduce your mouth to a new favorite dessert, Trader Joe's Chocolate Non-Dairy Frozen Dessert made with Coconut Milk! Call us coco-nuts, but this dessert is beyond addicting. It has a fluffy, creamy texture allowing you to eliminate the ice cream lag time that occurs when the ice cream is so hard it has to sit out before the spoon can actually break ground and find its way to your mouth. Coconut Milk Frozen Dessert is always the perfect consistency allowing you to improve your spoon to mouth speed leaving you with a smile and indulgent pleasure faster than ever! 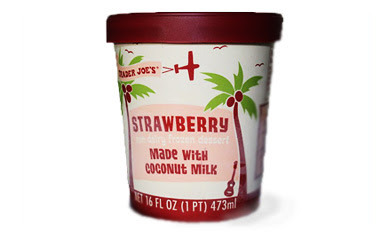 To make it even better, Trader Joe's also makes this non-dairy frozen dessert in strawberry! Get nutrition facts for Trader Joe's Chocolate Non-Dairy Frozen Dessert made with Coconut Milk. Higher in calcium than regular milk and almond milk. Nutrient Rich : Coconut milk is rich in a wide range of minerals and vitamins. It contains iron, selenium, sodium, calcium, magnesium, phosphorus and potassium, and also the following important vitamins: C, E, B1, B3, B5 and B6. Coconut milk is also a good source of protein. Boost immune system : Half the medium-chain fatty acids in coconut milk are composed of lauric acid, which is anti-viral, anti-bacterial, anti-microbial and anti-fungal thus strengthening the immune system. Weight Loss : The saturated fat in coconut is made up of short-chain and medium-chain fatty acids which the body quickly turns into energy instead of storing as fat. 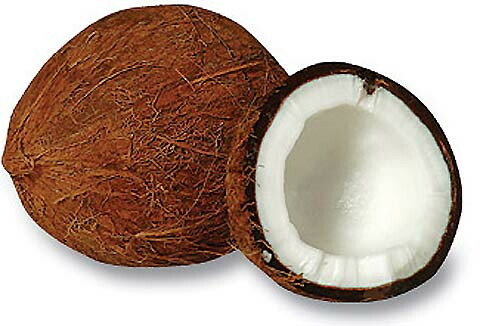 Therefore, even though it’s high in saturated fat, coconut can aid in weight loss. No wonder it’s the number one recommended milk for protein shakes. It is also said to boost metabolism.Coconut milk makes you feel full very quickly because of high concentrations of dietary fiber. Relaxes muscles and nerves: Rich in magnesium which can help relive and ease cramps, muscle pulls and muscle soreness. Aids in Digestion : Coconut milk contains beneficial substances that allow the stomach to digest food properly. Due to the high content of lauric acid, coconut milk is anti-bacterial and it kills off bad bacteria in the stomach that can cause you to not digest food properly. So adding coconut milk to your diet will help with digestion. Dairy Free, Nut Free and Vegan : Coconut milk is a dairy-free alternative for those who are lactose intolerant or allergic to nuts. This vegan drink is also soy-free and gluten-free. This looks so great! I am going to be on the look out! How's the sugar content?? sorry, just clicked the nutrition link! thanks!